St. Martha Catholic Church officially celebrated the 50th anniversary of Fr. Chester Borski’s priesthood on December 21, with a Mass of Thanksgiving. He was ordained 50 years earlier, in 1967, at the Basilica of St. Peter’s in Rome. Happily for us, Fr. Borski has shepherded his flock at St. Martha for the past 17 years. When word got out there were special events being planned this year, one of Martha’s Quilters’ members, our “fabric whisperer” Noreen, spearheaded an ambitious quilt project for the anniversary celebration. Yes … Martha’s Quilters would make Father Borski a quilt. This project took seven months to complete. The other members of our prayer quilt ministry carried our workload while this project was being created. This insured all the needs for quilts for sick parishioners were filled. It was decided that a “friendship quilt” was most appropriate, one with signatures of his friends and parishioners. A team of people began collecting the signatures and well-wishes on small rectangles of fabric. One of our members, Angela, and parishioner, Lourdes, were a tremendous help in collecting signatures. Fr. TJ helped with some of the clergy. Noreen even wrote Pope Francis a very nice letter to see if he would sign a block. Alas, a signed block was not meant to be. However, the Pope did send a letter and lovely rosary. After the multitude of signature blocks were gathered, Noreen sewed colorful pieces of fabric around each signature blocks. She then stitched the blocks together into a quilt top. The quilt has approximately 300 blocks which represent well-wishes from individuals, families and church groups, such as ACTS. We estimate this quilt represents one thousand people who have been touched by Fr. Borski. The design of the quilt block and layout was something Noreen hadn’t seen before. While on a trip to the Holy Land earlier this year, she found a tile design on the floor of the Church of the Holy Sepulcher. No kidding … this is the only other place Noreen had ever seen this design she would turn into a quilt block. Yes … the Holy Spirit had a hand in the design of the quilt. During the quilt top construction, Noreen also added prayers and scripture verses. After all the blocks were stitched together, 12 members of Martha’s Quilters worked to finish the quilt. They basted the quilt, Sally and Clara machine-quilted it, and Sally added borders. I had the privilege of machine-sewing the binding. Then the binding was sewn down by many hands, the pocket was embroidered, and finally, the hanging sleeve was made and sewn on. The quilt was displayed in the church narthex during the Fr. Borski’s Mass of Thanksgiving. On December 13, the week before his Mass of Thanksgiving, our little group of quilters presented the anniversary quilt to Fr. Borski in the parish office. Little did we know the heavenly significance of this date. Fr. Borski told us it was his mother, Lucy’s birthday, and also her patron saint, St. Lucy’s feast day. He told us that his mother was a quilter late-in-life and one of her projects was to make each of her children a quilt. Since Father was a priest, he urged his mother to first make all his other many siblings their quilts. His mother died before she could make that last quilt. Fr. Borski never got his quilt … that is … until his late mother’s birthday this year. I feel certain his mother was smiling down on the group assembled that day. Sneak preview alert! Martha’s Quilters have been busy again this year sewing, knitting, crocheting, embroidering and handcrafting one-of-a-kind items for sale! Come by St. Martha’s Fall Festival on Saturday, October 8, in the back of the church parking lot. Each year our ladies expand their horizons with unique creations! We will also have two quilts in the Silent Auction and one quilt in the live auction. Stop by and start your Christmas shopping! Cash, checks and credit cards will be accepted! St. Martha Quilters create quilt for Fall Festival live auction! Martha’s Quilters have been busy for months getting ready for this year’s St. Martha Catholic Church Festival & Market which will be held on Saturday, October 8. As always, our booth will have for sale some really unique handcrafted items such as Christmas gifts, lots of fun college items, baby wearables, table runners, adorable doll quilts, beautiful lap-size quilts and lots of items I haven’t even seen yet. Basically, something for everyone! Just be sure and stop by our booth! You won’t be disappointed! Our prayer quilt ministry group has again made a one-of-a-kind quilt for the live auction. Each of our members participated in making this quilt another masterpiece! Last year our Nativity quilt sold for $2,200. This year’s quilt is an adaption of a paper-pieced pattern called “First Snow” by Tina Curran. Lynn, one of our lovely and talented Martha’s Quilters, acquired the pattern a couple of years ago and promptly began collecting fabric for the project. A couple of months ago, I remember seeing Lynn hunkered down at her sewing machine with little pieces of colorful Christmas fabric flying all over the place. I thought she was making the whole quilt by herself. It wasn’t long before Judy, who sat next to Lynn most Wednesdays, was making blocks for the project. Lynn even taught Judy to paper-piece. Judy also designed the church block, which is not a part of Tina Curran’s design, but definitely just what our Festival quilt needed! I think Clara made some blocks as well. Several of our talented ladies … Noreen … Clara … and Sally come to mind … machine-quilted the project. I was privileged to sew the binding on … and Marie sewed the binding by hand to the back. Embellishments are next week. This quilt is stunning! The three-month project took our members hundreds of hours to complete and will be hanging in the narthex at St. Martha’s Catholic Church the weekend before the festival. Feel free to take a peek! Opening bid for this live auction one-of-a-kind Christmas quilt is $500. Nativity quilt … the rest of the story! 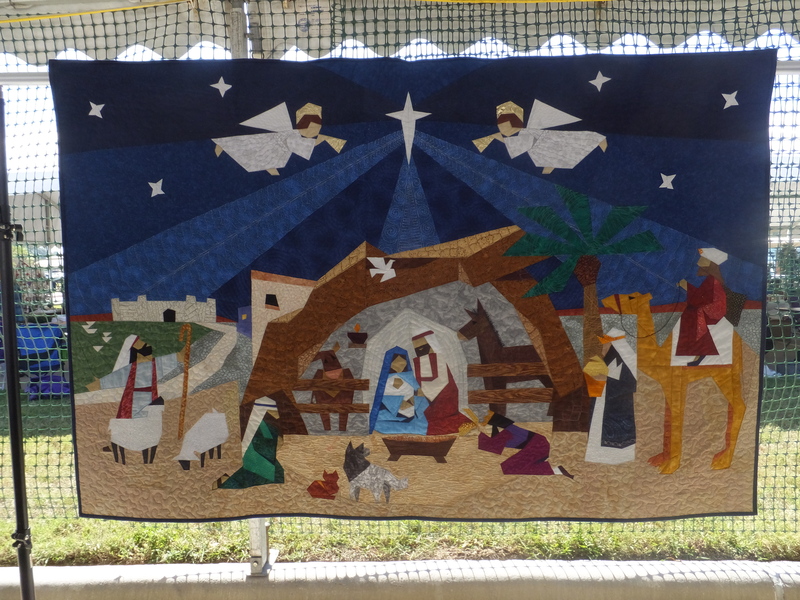 Our Nativity quilt was one of the items featured in the live auction at St. Martha’s Fall Festival on Saturday. It was a wonderful event for the whole family filled with fun, food, games for the kids, craft booths and fellowship! And yep … this is my final post about the Nativity quilt! The live auction started at 7 pm. For a few ladies who stood off to one side closest to our quilt, you could cut the tension with a heavy-duty rotary cutter! After a full day of working our craft booth, several of Martha’s Quilters were in attendance for the live auction. Finally, our quilt came up for bidding. Our demeanor turned anxious as our quilt was finally brought forward. The minimum bid was $1,000. I held my breath. Would anyone in the crowd even bid on such an expensive item? Five long seconds passed. Finally, a lady raised her hand in the front row. Then a lady on the second row raised her hand. They battled back and forth and when the dust settled … our Nativity quilt … the one seven ladies worked on for three months … 843 fabric pieces and over 250 collective hours … the same quilt I had dreams about … what if we didn’t get it finished in time kinda dreams … the auctioneer announced “sold” … for $2,200! A very happy ending to a long journey. Martha’s Quilters have been busy since July creating lots of one-of-a-kind handmade items for St. Martha’s Fall Festival. Our booth will be overflowing so come on by and check it out! Let’s see if I can list a few things we have for sale … college quilts (A&M, UT and LSU come to mind), lots of lovely quilts (fabric and crocheted), Christmas tree skirts, ornaments, seasonal table runners, fabric purses, felt purses, small rosary zippered bags, aprons, mug rugs, embroidered baby items (new this year and absolutely awesome), wine bags, designer fabric checkbook covers, rolling pin covers, and so much more we are going to knock your socks off! St. Martha’s Fall Festival is this Saturday from noon to 8 pm in the church parking lot. Lots of food, drink, activities for the kids, and oh … there is a live auction where, among other items, our fabulous Nativity Quilt will be auctioned to benefit our ministry and the parish! Nativity paper-pieced quilt – part nine – it’s done! We are finished with the Nativity quilt! Lots of detailed quilting was added this week. Check out the donkey’s mane and the manager! We certainly have some talented ladies. Two of our paper-piecing ladies were not present for our group photograph … Liz and Lynn. Marie and Maria joined us for the group photo. They did not participate in the paper-piecing part of the quilt but were such a great help with hand sewing the binding and hiding the thread tails. The Nativity quilt will appear at all Masses in the narthex this weekend and will be auctioned in the live auction at St. Martha’s Fall Festival on Saturday, October 3. Martha’s Quilters also has a booth with lots of wonderful handcrafted items at the Fall Festival! Nativity paper-pieced quilt – part eight – Sally machine quilts! Sally took a turn at machine quilting this past week and we are loving her results! Lots of detailing in different areas like giving the sheep and dog texture, detailing on the kings, manager, fencing, donkey and cow. Did you notice our cow actually has a nose? I’m sure I missed pointing out some of the areas she worked on. My eyes were glazed over on Wednesday in admiration of her work! I didn’t get a tally on the hours Sally spent quilting, but she still has it for a few more days. I also included a photo of Noreen’s sky quilting that I believe I left out a couple of weeks ago. Stunning! Many thanks to the lovely Maria who spent several tedious hours this week “hiding” the threads! It is a thankless job but it has to be done! Clara will get the quilt next week for the final round of quilting. Also completed this week … the binding is made and ready to be sewed on when the machine quilting is finished. The sleeve for the back of the quilt is also made so the finished quilt can be hung. Finally, the quilt label has been planned, Sally will embroidery, and we are nearing completion on an amazing project that has been a labor of love. Our Nativity quilt will be auctioned on Saturday, October 3, at St. Martha’s Fall Festival.